Do you have a bar cart? We have upgraded to a townhouse and have more space to work with, and I think the empty corner in our kitchen is screaming for a bar cart. Plus, the kitchen cabinets are what Ian and I like to call "Kirby-proof" (meaning they are too tall for me to reach) so a bar cart would be the perfect place to store our wine glasses. P.S. Don't forget to check out my guest post over on Fashion Truffles tomorrow! I'll be sharing some of my favorite pieces for fall. I have a bar cart but I think I need another. Mine is packed with booze. At least if I divide it up I wont look like such an alcoholic. I don't actually drink it, I just like to look at it. Thats my rational. Maybe the bedroom...? 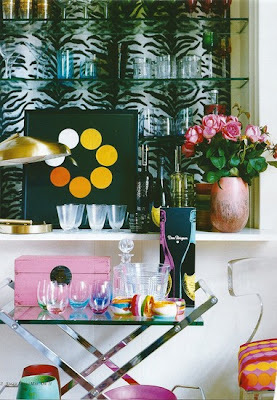 I love that bar cart! So sweet! We don't currently have one, but I would really like to get one...the only thing is my 1 year old is into everything right now...so open glasses and decanters could be hazardous! 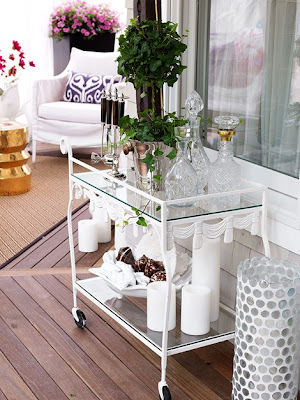 Love the all white patio cart and patio! very chic. I have a wooden one that i should paint! Glad you posted this because I was JUST trying to convince Jackie the other day that we absolutely need a bar cart in our place. It's so classic and old-timey... I don't know how much I'd actually use it, but the idea of making a drink upon the arrival of guests I rarely have over seems so cool. I've been on the hunt for the perfect bar cart! 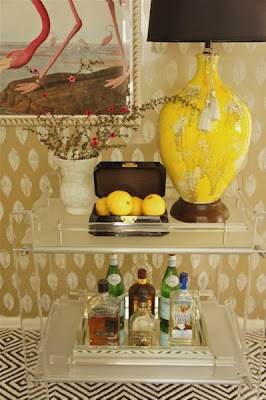 I absolutely swoon for bar carts, but we use a built-in bookcase for our booze and glasses! I love this! I have a small bar that I recently purchased, but now I wish I bought a lucite one! It's my new favorite home material. I want a bar cart too! I've been eying this one (http://www.cb2.com/dining-tables/dining/ernest-pool-bar-cart/f6752) it's a bit small but two together would look so cute and the colour is awesome! i still have yet to get one of these ~ but i love all of your choices here!! Love these bar carts. Adore the colors and chic styling in the third image!